Yesterday, Harley spent most of the day cajoling, begging me to have my hair cut. He countlessly complained how my hair always get in the way when he wrapped his arms around my shoulders. Whoa, cut my precious locks??? My reaction ranged from "Okay ka lang? Wa ka nabuang? Gusto mo yata ng sapak?!?" to simply pretending not to hear him. When he suggested that he'd pay for it, I realized how desperate he was. Kawawa naman. Sige na nga pagbigyan, I can just regrow my hair when he goes back to the desert. Here's my first pic with my new coif - with Rovin and his lovely wife. Someone told me I now like my yahoo avatar. 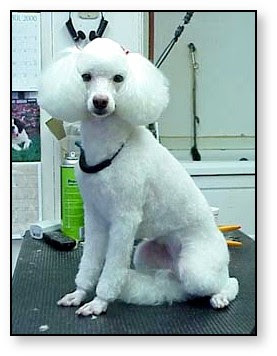 But I feel like I look more like this... a poodle.